More than one hundred days after Yolanda, the memories of ferocious winds, falling debris, dilapidated houses and devastation everywhere are still fresh in Jocelyn Barcoma’s mind. The 16-year-old girl, who was born and raised in Leyte all her life, admitted she still kept having nightmares about the devastation. Jocelyn’s story is not uncommon to hundreds of Yolanda survivors who are still struggling to restore their lives back to normalcy days after the supertyphoon slashed Leyte, Samar and other neighbouring islands, killing more than 6,000 people in the process and destroying billions of dollars worth of property. The ordeal is far from over, but Jocelyn, with the heart of a survivor, begins to look forward to the future, knowing that God is with her and her family on their long journey back to recovery. 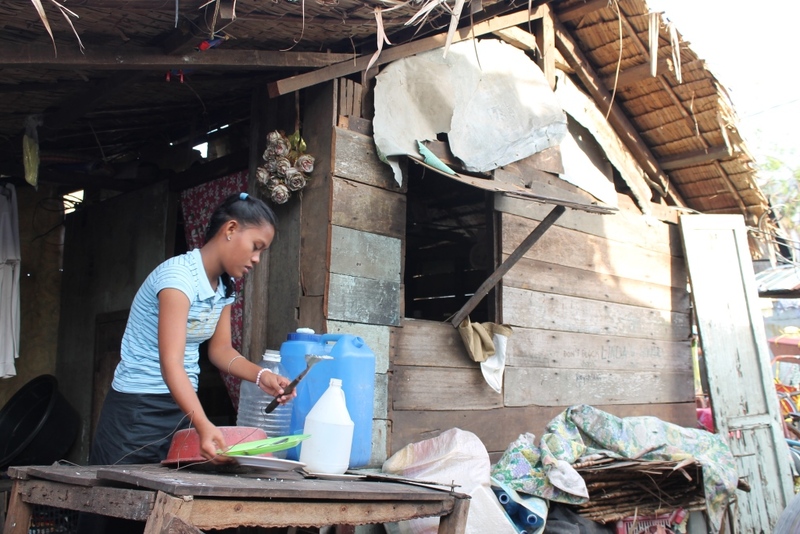 As the 5th child in a family of six living in a small town at Carigara, Leyte, Jocelyn is no stranger to hardship and financial difficulties while growing up. Her mom makes a living out of washing other peoples’ clothes, having no permanent income to support the family. Jocelyn barely remembers her father. He abandoned them when she was only 4 years old, and they rarely heard from him ever since. With the help of IN, Jocelyn manages to continue her education through highschool. She is now a 3rd year student in the School of Fisheries, an active member of the church and a daughter whom her mother dotes on. 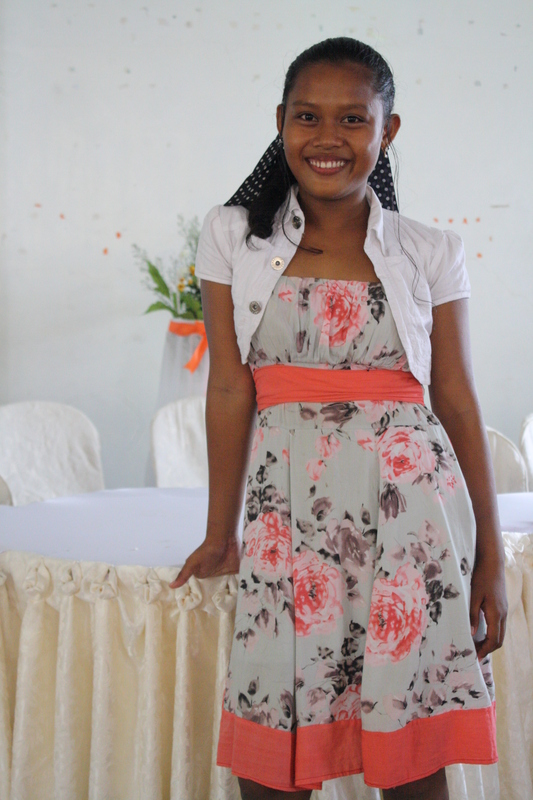 She is one of the remaining two Barcoma children who still have the chance to finish their highschool education. Jocelyn gleefully recalls that being a Batang Pag-asa (Child of Hope) helped her envision her future and career goals. Because of pastor lectures and church activities, she now dreams herself to be a teacher who can inspire her students in the future, just as IN and her ates and kuyas at church inspired her. Things are looking well for young Jocelyn and her family when Yolanda struck on November 08, 2013. Jocelyn has no idea that the typhoon’s ferocity will not only test her character, but also her faith. Jocelyn recalls that the night before Yolanda is a typical, calm one. That’s why when she tuned in to the TV before going to bed, she had been surprised that Leyte was placed under Signal #5, something that hasn’t happened for a long time in Eastern Visayas’ typhoon history. She prayed hard that somehow along the way, the storm would lose some of its power when it arrives to Leyte. The next day, the storm unleashes its deadly fury. At one point while telling her story, Jocelyn breaks off in a typical Pinoy humour by making light of an otherwise grim situation. While bracing themselves during the storm, her mother, an ardent Catholic, repeatedly urges her to read aloud Catholic reading materials, an action she vehemently refuses to do so because of her newfound faith. She finds it amusing that despite the chaos around them, she and her mother were still having a heated argument about religion. For Jocelyn and her family, surviving the aftermath of the storm has proven to be more difficult than surviving through it. Now that their house is no more and they’ve lost most of their possessions, starting everything again from the scratch is no less than a herculean challenge for her and other victims. That’s why when the IN team and her sponsor arrived six days after Yolanda, she was thankful beyond words. During the IN visit, what particularly struck Jocelyn is the spirit of hope that seemed to imbibe her when she and the team were distributing relief goods for the other victims. More than the relief operations and the avenue which IN granted to her to help other people, Jocelyn is also thankful for the inspiration the team has instilled to her. Being a Batang Pag-asa, she hopes she would also inspire the kids of her generation when the time comes. As what Jocelyn’s story taught us, Yolanda is not just about pain and loss. Above all else, it is also filled with stories of hope, compassion, unity and survival; a mosaic of stories told through those who are left behind to tell the tale. Jocelyn’s story is a story among many, but hers is filled with calm optimism, an unwavering spirit, and the drive to be an inspiration for others as she knows God wants her to be. And that in itself, is an inspiration at best.